The #power2cure movement more than doubled in 2017, and with your help we have been able to accomplish some incredible things! With the help of funds raised by spin4 crohn's & colitis cures, the Crohn's & Colitis Foundation accomplished so much in 2017! Sent 1,158 kids to Camp Oasis. Funded $28.6 million in research grants. Supported 11,777 people through our IBD Help Center. Embarked on new research initiatives to study the impact of environmental triggers on disease onset and progression. This includes the first ever nation-wide study of dietary intervention in adult patients with crohn's disease, called the DINE study. Developed quality measures for treating patients with IBD through our Quality of Care Program. Continued development of the largest and most innovative research & information exchange platform ever created - IBD Plexis - which will transform how research is done. be the 1st to know about our 2018 events & get access to early registration! 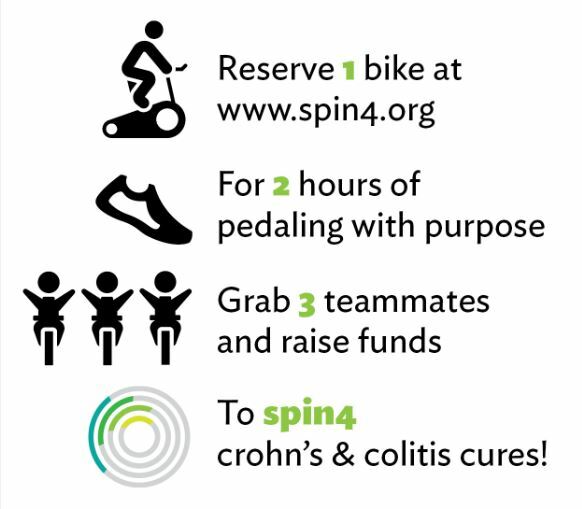 spin4 crohn's & colitis cures is an indoor cycling relay to find cures for the 1.6 million americans living with these debilitating, chronic, digestive diseases.